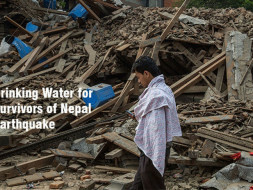 Goonj is extending relief to the survivors / victims of the recent earth quake in Nepal. Water is in scarce supply and there is also an issue of contamination post the calamity, which creates a high risk for water-borne epidemics. We are raising funds to aquire light-weight portable water filters (Lifestraw) which can transform microbiologically contaminated water into safe, clean drinking water - ideal for people displaced by natural calamities. Feetoffground headed by Aalok Bharadwaj is working with us to source the product from a wholesaler, and he has also very kindly offered to give us a handful of Lifestraw personals at no cost. Purchase about 400+ Lifestraw bottles called Lifestraw Go. Each has a capacity of filtering about 1000 litres / 264 gallons. To give context: 1 lakh ~ 200+ bottles, 2 lakhs ~ 300+ bottles , 3 lakhs ~ 400+ bottles. We have already initated purchase of Lifestraws worth 2 lakhs after meeting our first monetary goal, and will continue to do more. 10% of the funds will go towards logistics - direct shipment from wholesaler, freight charges and taxes. How does this work? Where does the money go? a. The money will be raised online via Milaap and through bake sales conducted by The Bake Collective in Mumbai and Bangalore. a. 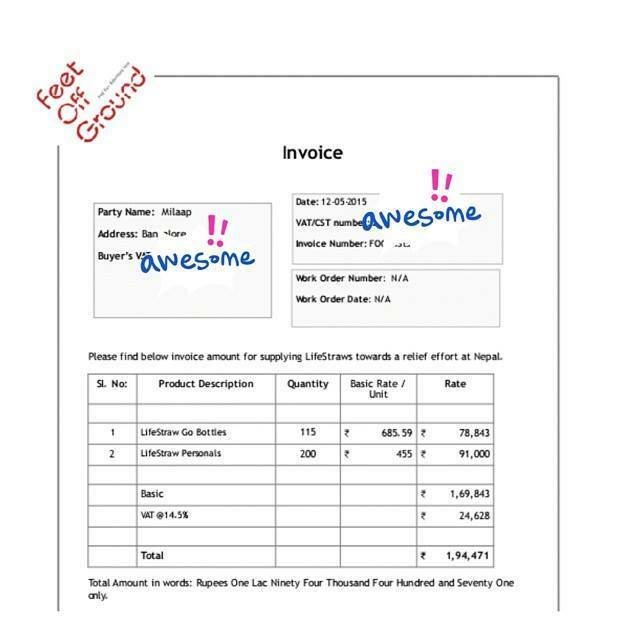 The money will be transferred to the wholesaler using support from FeetOffGround. b. The purchased items will be shipped to a location as per Goonj's preference. 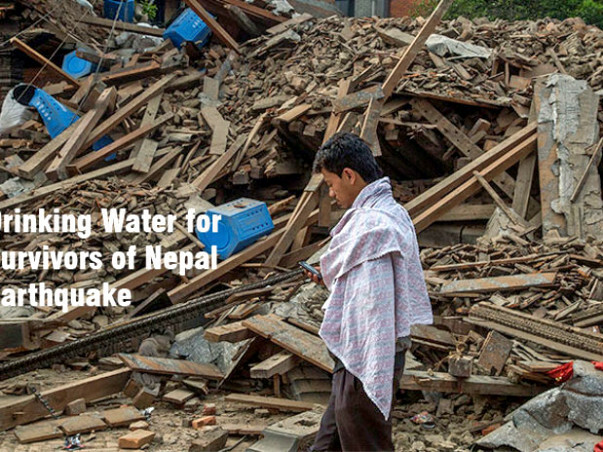 c. Goonj's relief team will handle the on ground distribution of Lifestraws in Nepal. 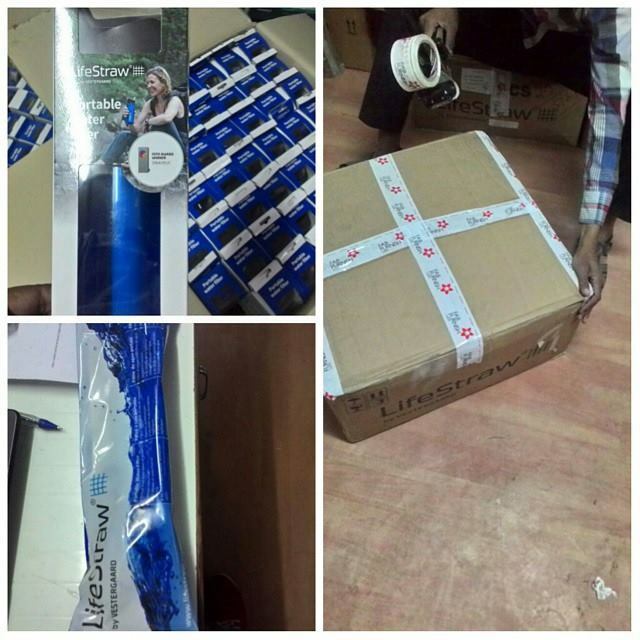 115 Lifestraw Go Bottles & 200 Lifestraws packed and ready to head to Goonj Delhi Office tomorrow. 2 lakhs (1.94 lakhs+ incurred payment gateway charges) have been withdrawn from the campaign to buy the Lifestraws and get them transferred to Goonj. Thank you for your help! Please spread the word and together lets raise 4 lakhs. Great job. I am thankful to you for giving me this opportunity. God Bless Nepal.